If God is for us, who can be against us?32 He who did not spare his own Son, but gave him up for us all—how will he not also, along with him, graciously give us all things? 33 Who will bring any charge against those whom God has chosen? It is God who justifies. 34 Who then is the one who condemns? No one. Christ Jesus who died—more than that, who was raised to life—is at the right hand of God and is also interceding for us. 35 Who shall separate us from the love of Christ? Shall trouble or hardship or persecution or famine or nakedness or danger or sword? I feel these words of Saint Paul are some of the most powerful words found in the New Testament. I hope you have portions of scripture that speak good news to you. If you do, I would love to know what they are. The words above are definitely good news for me! Paul is addressing anyone who is struggling. If you are having a difficult moment, season or year, Paul is talking to you! He reminds us that it is Jesus Christ who gave all of himself for our benefit! As if to say, even if there is someone who is standing against us, have no fear they are no match for God who gave us His Son. Paul is reminding us that God has our proverbial back. When we do face challenges in life, God promises to be there with us in the muckiness. But Paul is not done! Don’t be concerned when people falsely accuse you things. God is our only judge and it is Christ who justifies (accepts us fully). Don’t let the gossipers and accusers get under your skin! Our only concern should be God who watches over us. How many needless hours of worry have we spent on people who speak ill of us? I know I have. This reminds me to keep my mind fixed on Jesus and not on the naysayers. Paul asks then greatest rhetorical question of all time: Who (or even what) shall separate us from the love of Christ? Paul then lists a bunch of things that could feel like we’ve been separated from God’s care. This also a subtle acknowledgement that life will have its up and downs. There will be hard times but that doesn’t mean God has abandoned us. It is easy to think God has stopped loving us or walks away from us when life gets ugly. Then we hear one of the oddest phrases in all of scripture. …we are more than conquerors through Christ who loved us.Paul is telling us that even though we will have difficult moments in our lives, Jesus has already won the most difficult battle of all on the cross. We never have to wonder if God is with us in our darkest moment… God will be there. This phases could also be translated, “We win the supreme victory through Christ who loved us.” What is that supreme victory that has been won for us? That sin (or anything else) can separate us from God’s presence. We are then reminded that no matter what, God will never, ever leave us. 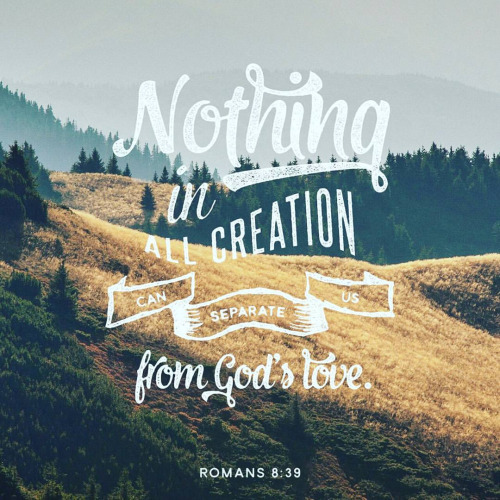 For I am convinced that neither death nor life, neither angels nor demons, neither the present nor the future, nor any powers, neither height nor depth, nor anything else in all creation, will be able to separate us from the love of God that is in Christ Jesus our Lord. God is good and we are loved! This is good news for me. I hope it is for you. Thank you! Why as Christians do we forget these truths?